Ocean warming (OW), ocean acidification (OA) and their interaction with local drivers, e.g., copper pollution, may negatively affect macroalgae and their microscopic life stages. We evaluated meiospore development of the kelps Macrocystis pyrifera and Undaria pinnatifida exposed to a factorial combination of current and 2100-predicted temperature (12 and 16 °C, respectively), pH (8.16 and 7.65, respectively), and two copper levels (no-added-copper and species-specific germination Cu-EC50). Meiospore germination for both species declined by 5–18% under OA and ambient temperature/OA conditions, irrespective of copper exposure. Germling growth rate declined by >40%·day−1, and gametophyte development was inhibited under Cu-EC50 exposure, compared to the no-added-copper treatment, irrespective of pH and temperature. Following the removal of copper and 9-day recovery under respective pH and temperature treatments, germling growth rates increased by 8–18%·day−1. The exception was U. pinnatifida under OW/OA, where growth rate remained at 10%·day−1 before and after copper exposure. Copper-binding ligand concentrations were higher in copper-exposed cultures of both species, suggesting that ligands may act as a defence mechanism of kelp early life stages against copper toxicity. 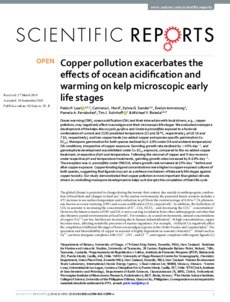 Our study demonstrated that copper pollution is more important than global climate drivers in controlling meiospore development in kelps as it disrupts the completion of their life cycle.